Ra Cosmetic's Black Soap Body Wash is a time tested mixture of shea butter, honey, coconut oil, and aloe that fuse together to bring back youthful vitality and vibrance to the skin. It washes away dir and other impurities from the day, allowing you to relax and feel refreshed. 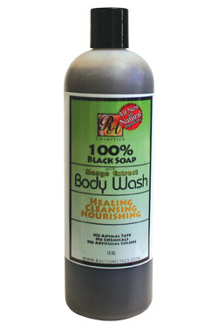 Black soap is an ancient cosmetic cleansing product from West Africa. It's made from the leaves of various plants and tree barks. Oils such as shea butter, palm oil and cocoa butter are added, and the mixture is hand blended by local women. The soap, also known as Ose Dudu, Alata and Anago, can be used on the face, body and hair. It is said to have therapeutic benefits. Why coconut oil is better than the average face moisturizer. And hair serum. And body lotion: "Commercial moisturizers contain lots of water, which makes you feel like your skin is being moisturized. But as soon as the water dries, your skin becomes dry again. Also, many commercial brands of moisturizers contain petroleum-based ingredients that can suffocate the skin. In contrast, coconut oil provides deep and real moisture. It helps strengthen underlying tissues and helps remove excessive dead cell on the skin's surface that makes your skin rough and flaky in texture. It also great for shine and as a natural moisturizer for your hair. Aloe vera is a natural remedy used for burns, scrapes and digestive health. The herb can even be used as a natural cosmetic and easily grown in any home garden.